Soar to new heights as the morning sun kisses the Santa Ynez Valley. This area of Santa Barbara has near perfect ballooning climate all year-round. Relax and take in the views of the picturesque vineyards against the majestic San Rafael mountain range. This flight is a nature lovers dream. Keep your eyes peeled as you try to spot wild boar, foxes, deer and more. As we float over wine country, your FAA certified pilot will show you the many ranches situated among the luscious valley, including Michael Jackson’s famous Neverland Ranch. Come and experience hot air ballooning with us in this spectacular region! Price: Regular rate $240 . Special online price $225 per person. Season: We operate throughout the year, weather permitting. Click here for more details. We are closed on Christmas Eve, Christmas Day, and New Year’s Eve. Please note that the full rate will apply on Valentine’s Day. Please call us directly for pricing and availability. Meeting Time: 6:30am sharp. All flight times are based on daylight savings time and times of sunrise and sunset. Please click here for more details. Meeting Location: We'll meet at 2432 Railway Avenue, Suite A, Los Olivos, CA 93441. Please click here for more location details. Flight Specifications: Flight duration is between 45 minutes to 1 hour • Up to 16 passengers per flight • Please allow 3.5 to 4 hours for the whole experience. Click here for more details. Total trip time includes: Transport from meeting location to launch field, setup of the balloon, flight and a post flight champagne celebration. Participation Requirements: No pregnant woman allowed or children under the age of five. Weight limit is 240 lbs per person and 480 lbs per couple. Please see our FAQ's page for further participation requirements. Included: Post Flight Traditional Champagne Celebration • Complimentary “Happy Birthday” or “Happy Anniversary” banner for special occasions. *please note that banners cannot be personalized. Not Included: Gratuities • Please note there is a 20% automatic gratuity for groups of ten or more. After everyone arrives at our meeting location, we will transport you in one of our vans to one of our launch sites. Once we arrive we will test out the winds aloft with one of our test balloons in order to determine the best location to launch from based on the wind conditions for the day. You’ll then get to see the whole process of the balloons being inflated ready for your unforgettable flight. Once we are all aboard we’ll begin our floating ascent into the skies. Get ready for a vista of rolling green hills! On an average day you may catch a glimpse of “Neverland Ranch” while floating over the surrounding vineyards and beautiful ranches. We offer flights that capture views over the beautiful wine country. You’ll be surrounded by the Transverse Mountain Ranges, the Channel Islands, Lake Cachuma and the historic towns of Solvang, Los Olivos, Buellton, Santa Maria and Paso Robles. Let the scenery and the tranquility take your breath away. Once we have safely landed we will toast our trip with a traditional post flight toast and continental style breakfast. CONTINUE THE ADVENTURE WITH WINE TASTING! Finish off an amazing day soaring into the skies with a relaxing afternoon of wine tasting! After getting an unforgettable bird’s-eye view of the spectacular vineyards, why not complete your experience by sampling some of the delicious wines they produce after your flight? 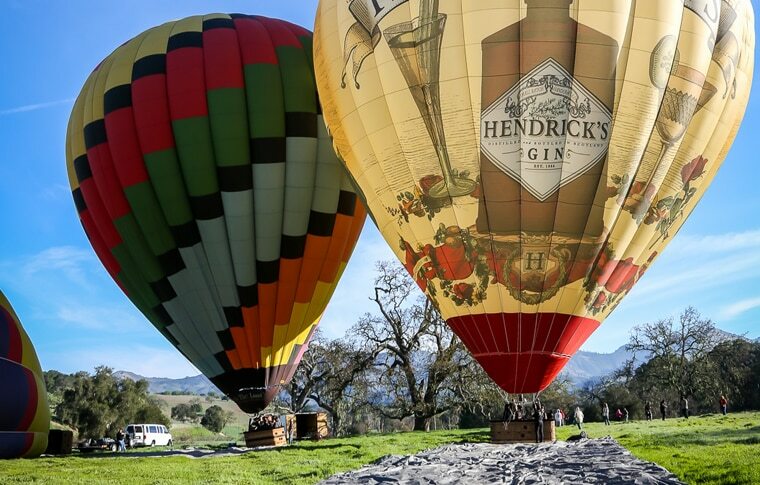 On this balloon and wine combination tour, you’ll get to taste some of the great wines from the Santa Ynez Valley. From grape to glass our knowledgeable guides will be on hand to tell you all about the processes that go into making each bottle exquisite! Includes: Guided Shared Wine Tour • Door-To-Door Transportation • Tasting Fees For Up To 4 Wineries • Educational Vineyard Tour • Gourmet Picnic Lunch • Gratuities. Please arrive on time. If you are late or miss your flight we are unable to offer you a refund. Weather conditions such as high winds and heavy rain can result in your flight not being possible. Please call us on the day of your flight to check in and confirm the status of the flight. Please wear appropriate closed toed shoes. High heels are not allowed. We recommend bringing a jacket in the winter months. A baseball cap is also advisable for men over 6ft. Please see our FAQ’s page for further details on what to wear. All of our pilots have over 4,000 hours of flight experience. We are proud of our impeccable safety record having successfully flown over 60,000 passengers without incident. We take pride in our state of the art impeccably maintained balloons. All of our balloons are inspected daily by our pilots and crew. They are also inspected by an FAA certified inspection station every 100 hours. Learn more about the balloons here. This flight is also available as a private balloon ride. Please see our private hot air balloon rides page for more details. I can honestly say that James and his crew made us feel safer than I could have imagined. the pilot Matt was EXCEPTIONAL. He was obviously experienced and in control of the crew and balloon.